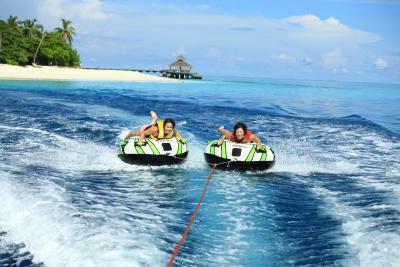 Lock in a great price for Reethi Beach Resort - rated 9.2 by recent guests. everything, the food, the people, the pure relaxation - so hope we can come back again very soon! Amazing place with very friendly staff, good food and excellent venue. Perfect to just relax and enjoy the scenery, beaches and snorkle around the island. There is plenty to do, even though its only a 500m long island. Feeding of sting rays and other fish every evening was entertaining for kids as well as adults. Amazing island with corals reefs , food was nice abs they change it every day 👍🏼 Nice villa, clean and beautiful. Everything: Beach bungalow is super, AI more than enough, the restaurants are all very good, especially the Moodhu. Staff very friendly and helpful.First time here, but surely return back till closing. The location was fantastic. Range of activities available was very good. Staffs communication skills were good. This resort island was chosen for honeymoon and we don’t regret it. Nice reef around, with lot of fishes. Very nice food without amount restrictions. I suggest to take full food package here, however breakfast and diner quite enough. Island provide diving courses. I tried Discovery dive for 154$. Instructors was very friendly and equipment was new. If you not restricted on money it’s nice place to pass PADI course around coral fishes. Clean rooms, nice sand, friendly stuff. Administration arrange nice concerts of live music and dancing with local musicians. The whole island has a beautiful relaxed atmosphere, there is no pretence and everyone is just there to enjoy the incredible surroundings. We were invited to cocktails on the beach just for choosing to stay at Reethi and nothing was too much to ask - the staff were amazing. We did the dolphin and sandbank safari trip which was out of this world, had dinner in two on-site restaurants: one on the water and another on the beach which were both perfect. Sunset cruise was stunning and snorkelling allowed us to see some beautiful sea life (even better than the Great Barrier Reef!). My husband and I have travelled the world but our trip to Reethi was our favourite holiday. Thank you to everyone there for making our trip so unforgettable. Nature was incredible. The reef was amazing with lots of colorful fish. We saw dolphins and turtles too. Don't bother to buy expensive snorkeling trip, we did (it included two different reefs) but it didn't bring any extra to what we had in front of our deck chairs on the house reef. The reef side of the island was super. The other side was very windy and the aggressive waves prevented swimming in most places (and rocks too). But I have never seen so beautiful ocean anywhere. It was like swimming in an aquarium. The standard villa was nice enough and we loved the open air bathroom and the private spot we had there on the beach. Some of the water villas were on a sand bank so we were happy we didn't choose them. There was also lovely garden in the middle of the island. Nice work. Absolutely fabulous,this resort is so well managed.The friendly staff is a joy and the island is so tranquil and mosquitoe free which makes your stay even more comfortable.The housereef is bleaching but still thousands of fish so great snorkeling. From the begin till the end you got pampered. One of our bestsellers in Baa Atoll! Reethi Beach Resort is located on the beautiful and lush Fonimagoodhoo Island, surrounded by a beautiful lagoon and white, sandy beach. It offers a fitness centre, a massage parlour and a spa and wellness centre. It features 5 restaurants and 5 bars. All air-conditioned rooms are equipped with a minibar, satellite TV and coffee making facilities. The private bathroom comes with hot/cold water, free toiletries and hairdryer. Dining options include Moodhu Bar& Restaurant, a 24-hour restaurant and coffee shop built on stilts over the lagoon. Reethi Grill is an open air restaurant that serves grilled food while Alifaan is a poolside restaurant that serves a selection of snacks. Saima Garden is a boutique restaurant serving Maldivian and International cuisine. Rasgefaanu is the main bar that also hosts disco nights, karaoke and quiz nights. 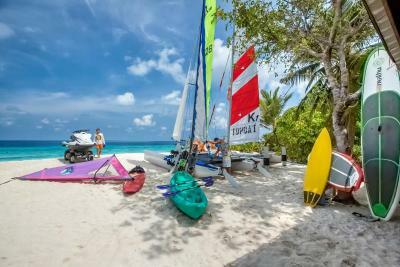 The other bars are Veyo Bar, Handhuvaru Bar, Sunset Bar and Riyaa Beach Bar where guests can enjoy refreshing beverages. This property is also rated for the best value in Baa Atoll! Guests are getting more for their money when compared to other properties in this city. Reethi Beach Resort has been welcoming Booking.com guests since 1 Feb 2016. 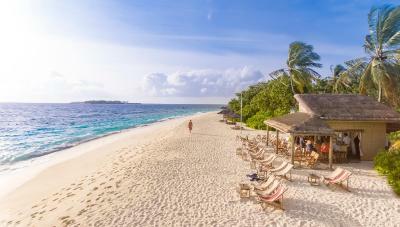 When would you like to stay at Reethi Beach Resort? This bungalow features a bathrobe, sofa and satellite TV. This double room features a balcony, DVD player and seating area. House rules Reethi Beach Resort takes special requests - add in the next step! Reethi Beach Resort accepts these cards and reserves the right to temporarily hold an amount prior to arrival. Transfer Rates Adult : USD 300.00 / Child (2 - 11.99 Years) : USD 150.00 / Infants (0-1.99 Years) Free of Charge. * Please note that to be able to get to the resort on the same day, guests must arrive on international flight before 22:00hrs in which case transfers can still be arranged by Domestic Flight & Speedboat. For seaplane transfers, the international flight has to land in Male’ by latest 15:00hrs in order to guarantee transfers on the same day. Guests departing Malé on an international flight earlier than 09:00 may need to check-out 1 day before the date of departure and stay overnight in Malé to reach the airport on time. Children are considered from 2 – 11.99 years. Room rates are based on 2 adults and additional charges apply for accommodation and mealplan depending on the season. The resort will inform you about such charges upon receipt of the booking. All children are subject to pay USD 6.00 per day (Green Tax). USD 116.00 per adult / USD 58.00 per child or as advised otherwise. Please note that the included meals for all meal plans are served in the main restaurant only. For bookings made on flexible rate, the full amount including transfer fees, taxes and other applicable charges will be deducted from the credit card within 30 days prior to arrival. For bookings made on non-refundable rates, the full amount including transfer fees, taxes and other applicable charges will be deducted upon receipt of the booking. The hotel listed 'all inclusive' on bookings.com, however, upon arrival we were told that it's actually called 'full board plus drinks' and not actually 'all inclusive'. This was despite many emails sent back and forth to the hotel, with reference made to 'all inclusive' from their side. However, it was not a big problem for us, we loved the food in the main restaurant, and we enjoyed drinks as well. Only felt a bit let down by excursions which were apparently for those on the proper 'all inclusive' plan. Had I known, I would have probably upgraded to that too. 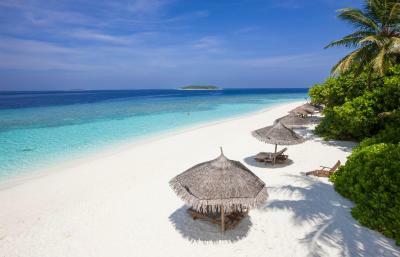 However, we are happy to have chosen Reethi Beach. I brought my wife on a surprise vacation to Reethi Beach for our 6th wedding anniversary. From the time I booked this vacation, the reservations department at Reethi were absolutely amazing and on the ball. When we got to Malé airport, a Reethi representative was waiting for us! He was super helpful, very accommodating and very friendly.. We took a 35 minute seaplane ride to Reethi Beach!! The views from the top were incredible! Only snag was the limited luggage of 20kg per person as opposed to Emirates with 46kg. But this was not the hotels fault. From the speedboat we could see how beautiful the whole Island was. The officials were so timeous to fetch us from the plane and gave us a smooth ride to the resort. The reception staff were very friendly and we were welcomed with ice cold coconut water. The receptionist guided us through the island to our water villas, showing us the main points of the island on the way. No words can describe how absolutely beautiful this island is, and how amazing the water villas are! I was really surprised at how spacious the villas were. We slept comfortably with myself, wife, and two kiddos under 5. They even gave a crib for the baby. The room and bathroom were neat and clean and it was great that the bathroom had a huge tub and a shower as well! The rooms were cleaned twice a day, once in the morning and once at night. Going directly from your room into the ocean was just wow!!!! We took a full board package including drinks... The food was endless... And the drinks were lovely!! It's important to take a package like this because food can be quite costly. Breakfast, lunch and dinner was a buffet, with a wide selection of dishes to choose from. The desserts - realllly yummy! As Muslim traveller's, it was great that there were lots of halal options! At Meal times, we had Ansaar helping us. He was so friendly and helpful at every meal. He made meal times really pleasant. Wifi at main bar is often slow, or don't working at all. Facilities were good but improvement can be made in food. Also, not all basic facilities such as toiletries were complete in rooms. Food was expensive but overall not very special (fish dishes were good though). For example ceasar salad was super small plate of lettuce and few crabs and olives but price was 15$ plus service charge and taxes. Also pizzas looked and tasted as they were from the freezer, not freshly made. Everything was amazing and beyond my expectations. I highly recommend i feel it was worth every penny and to be honest not as expensive as other resorts i would come back in a heartbeat. And the restaurants had a nice variety of food. Every resort is on its own island so there is no way not to feel disconnected from the world which is exactly what i needed more than i knew! Thank you reethi for an unforgettable experience.